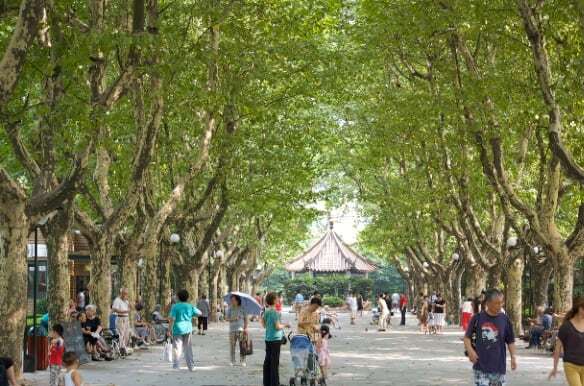 Chinese parks are a community hub. People come together to talk in the shade of the trees, to exercise, to dance, to watch movies and to write. It’s a wonderful thing to see people milling around enjoying the company and the location. Although parks are often located to busy roads they have a tranquility about them which is a welcome relief to the hustle and bustle of city life. Strolling around the parks was a total pleasure for us. Perfect for a spot of people watching and light relief from the sweltering heat. 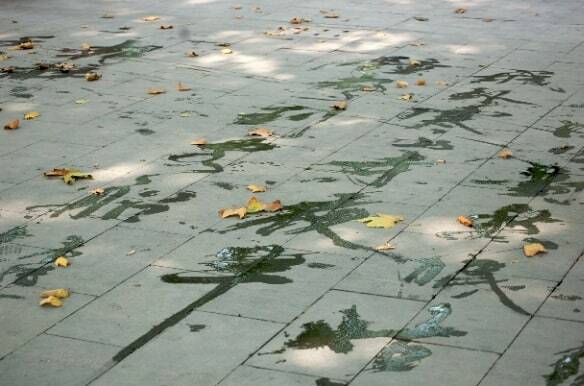 I was particularly fascinated by the men writing in water on the ground. I have no idea what they were writing but it was of great interest to other people who hung around to read as they wrote. 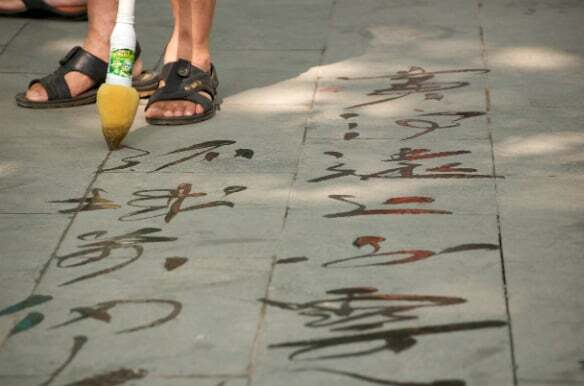 I wish I could read Chinese characters. I wonder if it was poetry or propoganda? 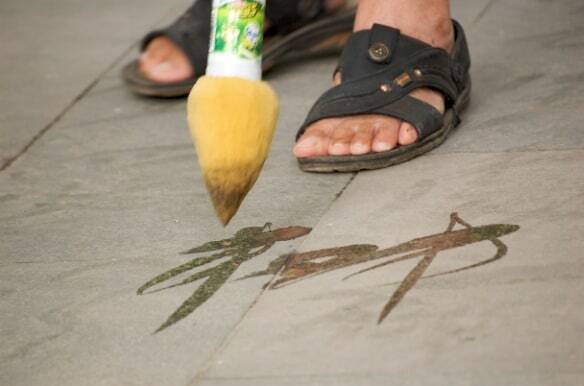 What ever it says I think it’s a cool idea that you can have a special water brush to make your pavement writing easy to do. The Chinese seem to have an ability to be very disciplined about what they do. 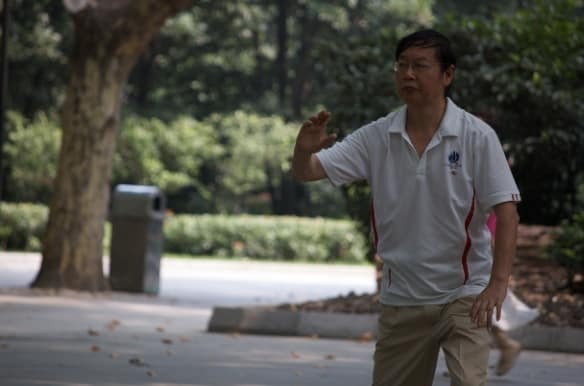 Tai Chi is both exercise and art form. 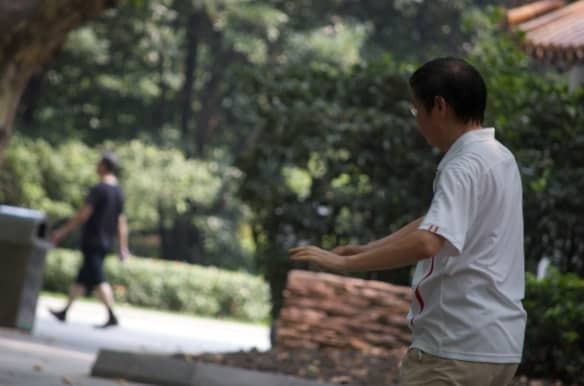 It’s also something people practise together in the park. I was mesmarised watching this gentleman run through his tai chi routine. He demonstrated such balance. 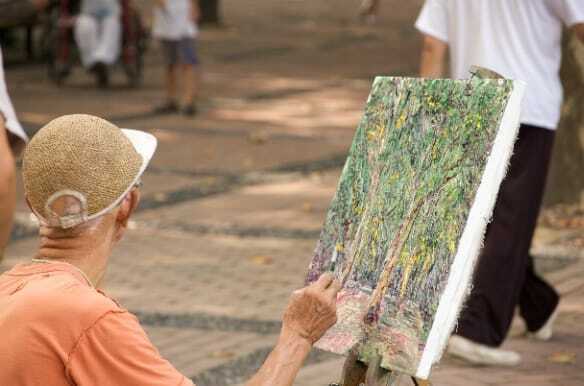 There was also an artist painting in the park, another form of art being performed. 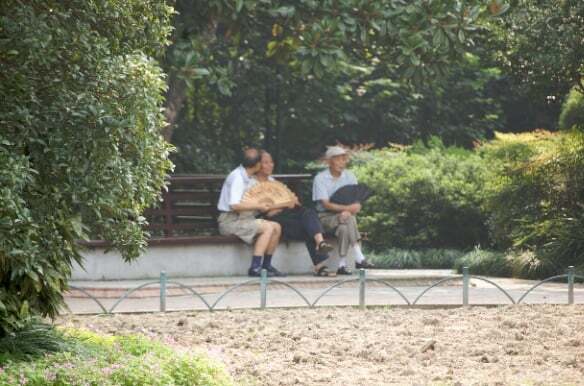 But mostly there were groups of old men having a chin wag in the shade. No doubt putting the world’s to right. And they say women can talk a lot! You might be surprised to know also that it was the men that had the biggest and most colourful fans in the park. All in all, the park is a wonderfully colourful place. I found the park peaceful yet bursting with life. All in all Shanghai has been a wonderful experience. It exceeded my expectations as a travel destination by miles. Having been to China before I wasn’t sure how different Shanghai would be to the other places I’ve visited. It was completely different in a positive way. We have tramped for miles all over the city and seen it from the ground up. I know there is much more of Shanghai to be seen but I’m satisfied we’ve seen as much as we could in the short time we had. There was plenty more we saw and did that I didn’t capture with my camera out of respect for the Chinese people. For example, the wonderful things on sale in shops, especially the food, arts and crafts. There is a fine line to being a tourist with a camera and being a nuisance. It’s been hard sometimes to tame my curiosity and passion to snap away with my camera but there are some things I’ve just had to hold in my head as a memory. There are plenty of those to hang on to until we’re able to return to this exciting, vibrant and delightful city. I love, love, love this post on the parks. This is the kind of place I could happily while away a day of people watching. 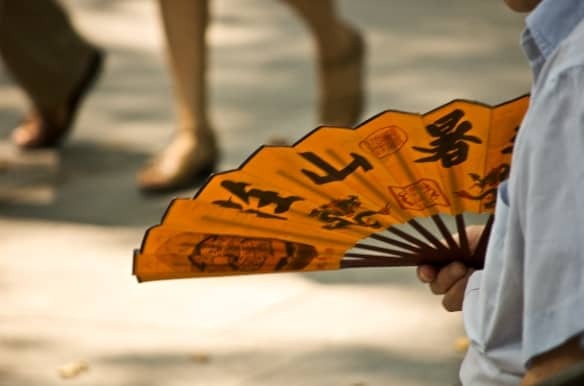 I enjoyed hearing your observations and looking at the photographs, which so beautifully captured the mood, feel and atmosphere of so many people simply enjoying their own moment, be it with art, conversation or feeling the refreshing coolness of a bright fan. As for those water brushes – the girls would LOVE them! I often give them a large paint brush and bucket of water to do ‘water art’ around the house on a warm day – but perhaps I should look at carving something out of foam – like the ones in your photographs.